In the first verses of the Book of Proverbs. King Solomon tells us that his words are meant to help others “to know wisdom, and instruction.” (Proverbs 1:2) In the spirit of the great King’s intention, we’ve been bringing you the trending topics of our day that affect investing and prudent money management. Here’s a rundown of the top five stories we followed in 2013. When lawmakers and the President couldn’t agree on budget issues, the Federal government shut down from October 1 to 15, 2013. Until a compromise was reached, agencies and services small and large all over the country were shuttered and employees placed on “hiatus.” National parks were closed and the Internal Revenue Service telephone lines unanswered, but taxpayers were till expected to meet IRS filing deadlines, and the Bureau of Housing and Urban Development kept its mortgage services available to avoid compromising the housing recovery. 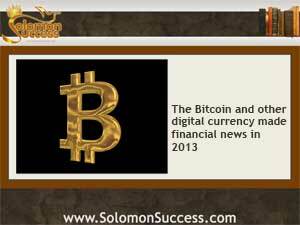 Although it’s been around for a while, the Bitcoin came into its own in 2013, trading higher than ever in the money markets and taking its place alongside other currencies for purchases like big-ticket cars, fertility treatments and trips around the world. A Bitcoin miner in the UK made headlines for tossing out a hard drive containing $7.5 million of the digital currency, and the Bitcoin and other digital currencies like the Ven and the Litecoin changed the way the world thinks about money. Learn secrets of investing at Jason Hartman’s Meet the Masters of Investing Event in Irvine, CA January 19-10, 2014. Find out more here.